If you like a golf but need a bit more space, or use country roads and need a higher ride height than a Golf offers, this Tiguan may be your solution. The base model as tested is in effect a normal two wheel drive station wagon version of a Golf . What you get is the extra space, a more upright and higher seating arrangement and the ‘middlemannetjie’ on a rural road wont bother you. I really like these Tiguans, the luxury and performance of a Golf with the practicality of a station wagon/SUV. to feel nimble and enjoy a reduced thirst for petrol. They are both SUV and MPV. A number of motoring critics have said that the interior is sombre. I do not agree with them. It is sensible, ergonomic and well laid out. The materials used give the impression of quality. The black finish looks neat and purposeful. The leather multi-function steering wheel and gear knob give the car a luxury feel. The cloth trimmed seats are comfortable and fairly adjustable. Fit and finish appears to be excellent. I found the car very pleasant to dive. All round visibility is good, the more upright seating is comfortable and the controls are easy to hand and have a quality feel to them and make it easy to drive. I found the 90kW engine a little laboured at times but still capable to get you where you have to get. The car handles well even with the slightly taller stance. It is not sporty like a GTi , but it is a pleasure at the wheel. The brakes are well balanced and cornering as well as general handling precise and predictable. Economy is very decent but not spectacular. VW claim a combined consumption figure of 6.5l/100km. I got just over 7.5l/100km which is more than acceptable. These new generation turbocharged petrol engines take performance and economy to new levels. The 4×2 Trend & Fun is an interesting mix of sophisticated and basic. Its price is misleading simply due to the very basic specification, meaning that you have to fit expensive “accessories” to match for example the Ford Kuga which includes them in the sticker price. So for example climate control (as opposed to plain aircon) costs R4400 extra, park distance control R4 150, front fog lights R1 950, service plan for 90 000km is R2 492 or maintenance plan for 120 000 a whopping R25 992. It all adds up. Practical, good looking and efficient. That about sums up this Tiguan. Tiguans all come with a raft of active and passive safety and performance measures from ABS to spin control and a stability programme. 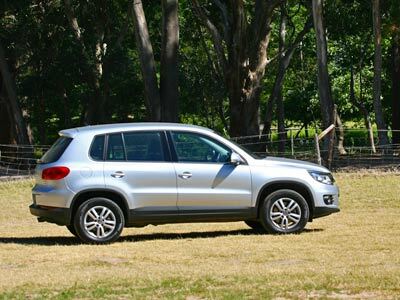 The Tiguan ISi 4×2 Trend & Fun as reviewed costs R312 000, but we would recommend you go for the 118kW version at R345 200 especially if based on the Highveld or if you expect to load her up a bit. Also check out the Ford Kuga, Honda CRV, Toyota Verso, Renault Duster and Nissan Qashqai. 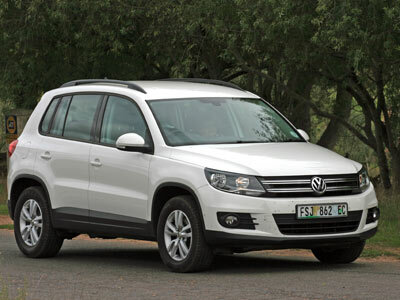 The top of the line Tiguan is the 2.0 TSI Sport & Style at R446 250 which comes with 7 speed DSG and AWD. There are 8 models to choose from. It comes standard with a 3 year or 120 000 km warranty, 12 year corrosion warranty and a 60 000 maintenance plan. VW are good at spotting a little niche and creating a new vehicle from an existing platform. 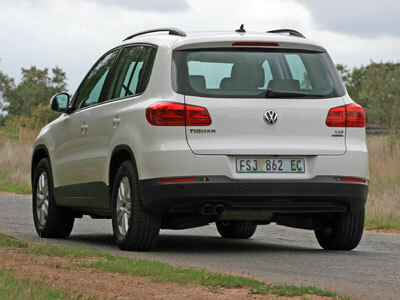 In the case of the Tiguan, they followed the rest of the pack and came up with a quite compelling package. It is in effect a Golf with a bit more space, high er ride hight and a much bigger boot, provided you fold the seats forward. A Golf for the business owner or outdoor person. If you look at it in this light, then the 4×2 version which we tested when compared to the Golf makes a lot of sense. 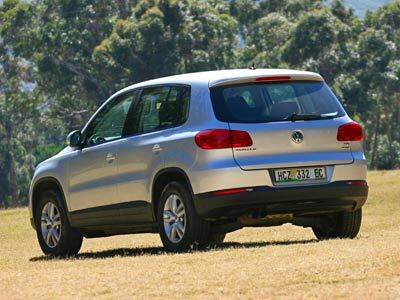 The equivalent golf, the 2.0 TDI Highline Manual costs R315 800, this Tiguan R294 800. I know the specs are a little different, but not much. If anything, the Tiguan’s basic spec list is more practical than the Golf’s. The model we tested was the 6 speed manual 2.0 turbodiesel 4×2 Trend & Fun with 81kW and 280Nm between 1750 and 2750rpm. It has a top speed of 174km/h and takes around 12 seconds to get to 100km/h. The claimed fuel consumption of 5.3 litres/100km must have been achieved in dreamland. Expect around 6.5 litres/100km at best. The courtesy lights built into the mirrors are a nice touch, makes getting in and out at night a breeze. The automatic light system which switches on when it senses fading light works well. 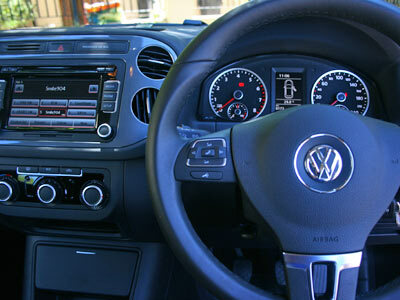 The dash layout and finishes are typical VW and I think are well thought out and well made. The feel of the switches is superior. With the rear seats folded the boot becomes enormous. The car we tested was a little sluggish at low revs and lacked oomph at manoeuvring speed. But once on the go and with the turbo in full song it is different matter all together. The Tiguan has two blind spots. The “A” pillars are a little thick, causing a minor blind spot. The other blind spot is to the left and slightly behind the car. The rear seats do not quite fold flat, but do fold enough to make an enormous boot. We have heard numerous reports of turbo and water pump failures on this range of VW engines, but then they sell huge numbers of them. 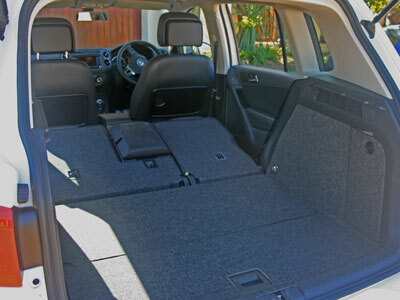 The Tiguan is a Golf with serious space for shopping when the rear seats are folded down. It cannot compete with the likes of a Freelander or X-trail offroad, but rides higher than a Golf. It is almost as good as a Golf on tar. I think it is a very real option to look at if you want a compact car but need a bit more space and practicality. I enjoyed driving it. Also look at the Nissan Qashqai (R324 925, but is well appointed) and Juke (R226 925), Kia Sportage (R303 995, includes park assist etc) amd Mitsubishi ASX (R297 900). List price R289 100, Price as tested R346 450, extras fitted: towbar, roof rails, front foglights, park assist with reverse camera, satnav and leather seats.